Lori Wick's bestselling series The Kensington Chronicles (more than 375,000 copies sold) has a fresh, new look sure to please her longtime fans and draw a new generation of readers. Set in the 1800s, this series captures the adventure, wealth, and romance of the British empire. When the king commands Bracken to marry, high-spirited Megan is chosen to fulfill the edict. Unskilled in the ways of love, Bracken finds Megan captivating, yet cannot seem to voice his feelings until he almost loses her forever. ^is chosen to fulfill the edict. Unskilled in the ways of love, Bracken finds^Megan captivating, yet cannot seem to voice his feelings until he almost loses^her forever. About "The Knight and the Dove (#04 in Kensington Chronicles Series)"
Lori Wick is the bestselling author of 17 books, including her latest, Promise Me Tomorrow, the Rocky Mountain Memories series, the Kensington Chronicles series, and the A Place Called Home series. As of 1997, her books have sold more than one million copies. Wick is currently working on her 18th book. She lives with her husband, Bob, and their three children in Wisconsin.- Publisher. 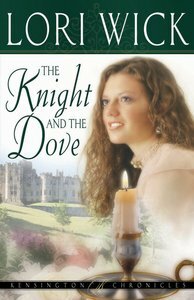 Customer Reviews For "The Knight and the Dove (#04 in Kensington Chronicles Series)"
The last in the Kensington Chronicles, The Knight and the Dove takes you back to the namesake of Bracken Castle.